Queen Lili’uokalani was Hawaii’s last monarch. She composed Aloha ‘Oe and other songs you can learn to play the Ukulele Mele Way. Queen Lili’uokalani (September 2, 1838 – November 11, 1917) was the last monarch of the kingdom of Hawai’i. 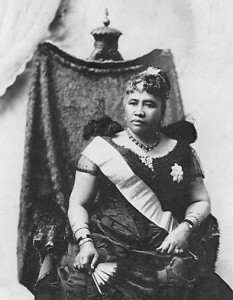 She ascended to the throne on January 29, 1891 at age 52 after the death of her older brother King David Kalākaua on January 20. During her reign from 1891 – 1893, Lili’uokalani tried but failed to restore the powers of the monarchy and voting rights of the people that had been taken away by the earlier Bayonet Constitution in favor of an elite group of businessmen and wealthy landowners (many of whom were Americans). On January 17, 1893, a U.S. military-backed coup deposed the queen and formed a provisional government with Sanford Dole as president. Lili’uokalani appealed to U.S. President Grover Cleveland who (based on the Blount report) proposed to return the throne to her if she granted amnesty to everyone responsible. Lili’uokalani refused. On January 16, 1895, Lili’uokalani was arrested when firearms were found at the bases of Diamond Head crater several days after the failed counter-revolution led by Robert William Wilcox. She was sentenced to 9 months imprisonment in an upstairs bedroom of Iolani Palace where she composed songs and worked on her memoirs. On September 6, 1895, Lili’uokalani was released and returned to Washington Place where she was placed under house arrest for a year. In 1896, the Republic of Hawaii gave Lili’uokalani a full pardon and restored her civil rights. She made several trips to the U.S. to protest against annexation and attended the inauguration of U.S. President McKinley. On August 12, 1898, troops from the U.S.S. Philadelphia came ashore and raised the U.S. flag at Iolani Palace to mark Hawaii’s annexation as a territory of the United States. Lili’uokalani and other Hawaiian nobles did not attend. Lili’uokalani lived out her days at Washington Place until her death in 1917 at the age of 79. She had resided there since her marriage to John Owen Dominis on September 16, 1862. He died on August 27, 1891 just seven months after Lili’uokalani had become queen. They had no children, but she adopted his son, John Aimoku Dominis. Since 1918, Washington Place has been the Executive Mansion for twelve territorial and state governors of Hawaii. Read more about Queen Lili’uokalani by the History channel. Here are five songs composed by or about the Queen that you can learn to play the Ukulele Mele Way with downloadable song sheet, video lesson, audio recording, and video story behind the song in keeping with Hawaiian oral history traditions – click on the song’s title to listen to an audio sample. Aloha ‘Oe with Morse Code Strum for ‘ukulele. Ku’u Pua I Paoakalani with Pick in 4 Strum for ‘ukulele. Makalapua with I Wanna Rest Strum for ‘ukulele. Queen’s Jublilee with Morse Code Strum for ‘ukulele. Sanoe with 2 Waltz Strums for ‘ukulele. Ready for Valentines Day? Instead of chocolate and flowers, why not serenade your Valentine by playing a love song on your ‘ukulele? No need to sing (unless you want to) as you play along to the audio recordings by the professional husband-wife duo, The Hawaiian Serenaders. Not enough time to learn to play the song before the special occasion? No problem – just play the audio recording and enjoy the music – it’s free! Learn to play the above songs via private webcam lessons with me from the comfort of your home. No need to travel to Maui to take private lessons unless you want to. But wait, there’s more! 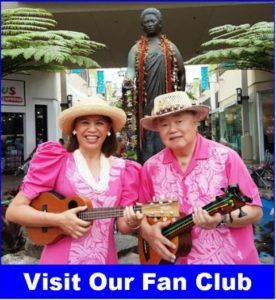 Visit my online Fan Club to listen to all 98 audio recordings of songs you can learn to play the Ukulele Mele Way. Schedule a lesson and I will send you the PDF song sheets for the audio recording for your selected song. No one else teaches my method of forming chord shapes with minimal muscle strain and unique strumming styles for the ‘ukulele. Besides, you can learn to play Hawai’i’s official instrument, the ‘ukulele, from a Native Hawaiian with over 50 years of ‘ukulele playing and entertaining experience. Learn from me today! To inspire you this month, here are 5 Hawaiian and hapa haole party songs that you can learn to play The Ukulele Mele Way as you celebrate Thanksgiving with your friends and family. Subscribe to Complete Monthly Online Lessons for Advanced players to learn to play all 5 songs and 45 others for 30 days at-a-time access. Plus, only online do you get the video stories behind the songs in keeping with Hawaiian oral history traditions whether the song is Hawaiian or not. Try out the One Month Trial or the Recurring Monthly Package to save $5 per month. Purchase Nostalgic Hawaiian Songs Volume One packaged set of book/DVD/CD to learn “On the Beach at Waikiki” plus 5 other songs. The set will be mailed to you. What makes me a unique ‘ukulele teacher? How is my method unique? Questions? Contact me for general questions, or schedule a private webcam lesson to get feedback from me about what you’re learning from the comfort of your home. American songs to play the Ukulele Mele Way. 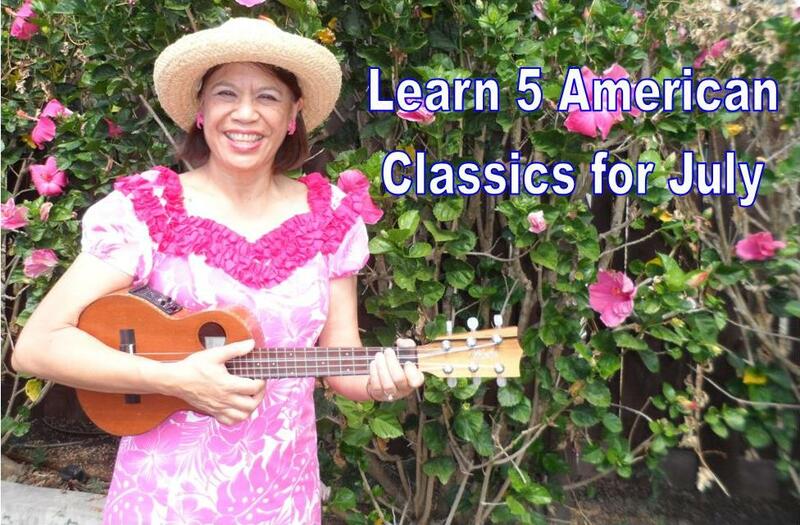 To inspire you this month, here are 5 American classic songs that you can that you can learn to play The Ukulele Mele Way as we celebrate Columbus Day on October 10th. Just as Columbus discovered America, we hope you enjoy discovering fun ways to play your favorite American songs on ‘ukulele. Subscribe to Complete Monthly Online Lessons aka Advanced Online Lessons to learn to play all 5 songs plus 45 others for 30 days at-a-time access. Plus, only online do you get the video stories behind the songs in keeping with Hawaiian oral history traditions whether the song is Hawaiian or not. Purchase Sing-Along Songs Volume One packaged song set of book/DVD/CD to learn She’ll Be Comin’ ‘Round the Mountain, Swing Low Sweet Chariot, plus 4 other songs. Purchase Sing-Along Songs Volume Two packaged song set of book/DVD/CD to learn Medley: Daisy Bell/Sidewalks of New York, The More We Get Together, When Johnny Comes Marching Home, plus 3 other songs. Purchase Hapa Haole Songs Volume One packaged song set of book/DVD/CD to learn Let Me Call You Sweetheart, plus 5 other songs. To inspire you this month, here are 5 songs composed by Queen Lili’uokalani that you can that you can learn to play The Ukulele Mele Way as we celebrate the Queen’s birthday on September 5th. She was Hawai’i’s last monarch. Subscribe to Complete Monthly Online Lessons for Advanced players to learn to play all 5 songs plus 45 others for 30 days at-a-time access. Plus, only online do you get the video stories behind the songs in keeping with Hawaiian oral history traditions whether the song is Hawaiian or not. Purchase Nostalgic Hawaiian Songs Volume One packaged song set of book/DVD/CD to learn Makalapua and Sanoe plus 4 other songs. Purchase Nostalgic Hawaiian Songs Volume Two packaged song set of book/DVD/CD to learn Ku’u Pua I Paoakalani plus 5 other songs. No need to read music to learn the Ukulele Mele Way. My method shows how to form chords without muscle strain, plus you learn unique strums taught nowhere else. I am an experienced educator and entertainer with over 50+ years playing the uke. I offer different ways online and offline line to learn from wherever you live in addition to lessons on Maui. I give free Fan Club access to 95 audio files of songs available to learn via private lessons on Maui or via webcam. To inspire you this month, here are 5 Island Songs with unique ‘ukulele strums that you can learn to play The Ukulele Mele Way as we celebrate Hawai’i’s Admissions Day as the 50th state of the union on August 21, 1959. Subscribe to Complete Monthly Online Lessons for Advanced players to learn to play all the songs plus 45 others for 30 days at-a-time access. Plus, only online do you get the video stories behind the songs in keeping with Hawaiian oral history traditions whether the song is Hawaiian or not. Purchase Nostalgic Hawaiian Songs Volume One packaged song set of book/DVD/CD to learn On The Beach At Waikiki and Hula o Makee plus 4 other songs. Purchase Nostalgic Hawaiian Songs Volume Two packaged song set of book/DVD/CD to learn Hawaii Aloha plus 5 other songs. Purchase Hapa Haole Songs Volume One packaged song set of book/DVD/CD to learn Maui Girl plus 5 other songs. To inspire you this month, here are 5 American classic songs with unique ‘ukulele strums that you can learn to play The Ukulele Mele Way as we celebrate the 4th of July. 1. America the Beautiful – with Pick in 4 Strum. 2. Camptown Races – with Hum Ding-Ah Strum. 3. Clementine – with Waltz Strum: Thumb Pluck and Pick in 6 Strum. 4. Down in the Valley – with 2 Waltz Strums: Thumb Strum Up/Chicken Pluck. 5. For He’s A Jolly Good Fellow – with Chalang-alang Strum. America the Beautiful – Subscribe to Complete Monthly Online Lessons for Advanced players (learn all 5 songs plus 45 others) or purchase Sing-Along Songs Vol. 1 packaged set of book/DVD/CD. Camptown Races – Subscribe to Beyond the Basics online lessons for Intermediate players or purchase Sing-Along Songs Vol. 1 packaged set of book/DVD/CD. Clementine – Subscribe to Basics online lessons for Beginners or purchase Sing-Along Songs Vol. 1 packaged set of book/DVD/CD. Down in the Valley – Subscribe to Basics online lessons for beginners or purchase Sing-Along Songs Vol. 1 packaged set of book/DVD/CD. For He’s A Jolly Good Fellow – Subscribe to Basics online lessons or purchase Sing-Along Songs Vol. 2 packaged set of book/DVD/CD. Are you ready for a summer project to get better playing your ‘ukulele? To inspire you this month, learn 5 adventure songs as the music transports you to another place and time. Sloop John B – traditional (Key of C, 3 chords, Latin Strum). Jamaica Farewell – traditional (Key of G, 3 chords, Latin Strum). Camptown Races – by Stephen Foster, 1850s (Key of G, 3 chords, Hum Ding-Ah Strum). Henehene Kou Aka – traditional (Key of F, 8 chords, I Wanna Rest Strum). Hawaii Calls – by Harry Owens (Key of F, 6 chords, Bossa Nova Strum). Sloop John B – Subscribe to Beyond the Basics online lessons or purchase Sing-Along Songs Vol. 2 packaged set of book/DVD/CD. Jamaica Farewell – Subscribe to Beyond the Basics online lessons or purchase Sing-Along Songs Vol. 1 packaged set of book/DVD/CD. Camptown Races – Subscribe to Beyond the Basics online lessons or purchase Sing-Along Songs Vol. 2 packaged set of book/DVD/CD. Henehene Kou Aka – Subscribe to Complete Monthly Online Lessons and learn all 5 songs plus 45 others (bonus full video stories only available here). Hawaii Calls – Subscribe to Complete Monthly Online Lessons or purchase Hapa Haole Songs Vol. 1 packaged set of book/DVD/CD. In Hawai’i, May 1st is also known as May Day is Lei Day. Invented in 1927 by an island artist and newspaper writer (Don Blanding and Grace Tower Warren) the spring celebration includes elementary school programs of island songs performed by each of the classes for the royal court. Don Blanding is also credited with the invention of the custom of tossing your lei overboard when you sailed from Honolulu, Oahu. If the lei came back to shore (and most did), it supposedly meant you would return to Hawaii someday. This month in keeping with the May Day tradition, you can learn 5 songs about the Hawaiian islands. Learn to play these songs by subscribing to Complete Monthly Online Lessons with unlimited access to 50 songs for $50 for 30 days at-a-time. Intermediate and advanced ‘ukulele players will have an easier time playing the songs with 2-13 chords. Learn more. Questions? Schedule a private webcam lesson to learn with me from the comfort of your home. In celebration of Earth Day on April 22 this month, let’s learn 5 songs about Hawai’i’s beautiful places. Some of the songs are considered hapa haole, meaning Hawaiian style music with English lyrics. Some of the songs take place around Waikiki, on the island of Oahu, and some tell general stories about the beauty of the islands. Intermediate and advanced ‘ukulele players will have an easier time playing the songs with 5-14 chords and some complex strums. 1. Soft Green Seas by R. Alex Anderson (Key of D, 14 chords, I Wanna Rest and Latin Strums). 2. Royal Hawaiian Hotel by Mary Robins (Key of F, 9 chords, I Wanna Rest Strum). 3. Hawaiian War Chant – by Prince Leleiohoku (Key of C, 5 chords, I Wanna Rest and Latin Strums). 4. Kuu Pua I Paoakalani – by Queen Lili’uokalani (Key of D, 6 chords, Pick in 4 Strum). 5. Hawaii Calls – by Harry Owens (Key of F, 6 chords, Bossa Nova Strum). Subscribing to Complete Monthly Online Lessons and learn all 5 songs plus 45 others (bonus full video stories only available here) with access for 30 days at-a-time. Purchasing the packaged song set for Nostalgic Hawaiian Songs Vol. 2 and learn Hawaiian War Chant, Kuu Pua I Paoakalani, plus 4 more songs. Purchasing the packaged song set for Hapa Haole Songs Vol. 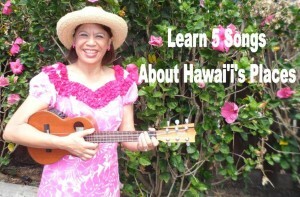 1 and learn Hawaii Calls, Soft Green Seas, plus 4 more songs. Questions? Schedule private webcam lessons to learn with me from the comfort of your home.